Top: Mariner-Stripe Plus-Size Boat-Neck Tee in Black Stripe from Old Navy. Bottom: Frayed Skinny Crop Jeans in Wild Pollen from Loft. Shoes: New York Westley Loafer in Black Patent from Kenneth Cole. If there is one fat-hating fashion narrative I despise the most, it is this: Dress so that you're not seen. Whether it's admonishing us against wearing bright colors, because they make us too noticeable, or describing as "flattering" any garment designed to conceal our shapes beneath billowing fabric, I hate it. 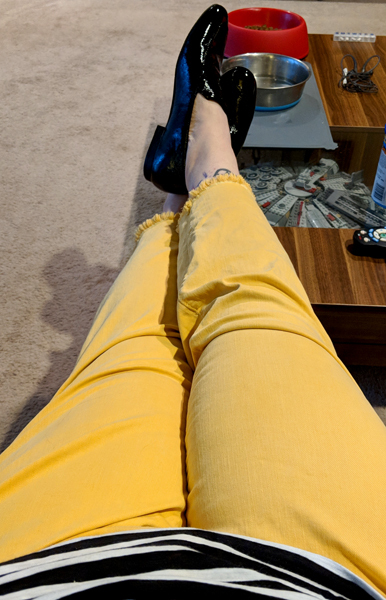 I love walking around in my loud yellow pants and horizontal stripes, and, if anyone has a problem with it, that's their problem, not mine. I take up space and won't be made to feel ashamed about that. And that, friends, is why Fat Fashion is radical. Anyway! As always, all subjects related to fat fashion are on topic, but if you want a topic for discussion: Are there any trends you're fervently avoiding or enthusiastically embracing at the moment?